Teacup Yorkies weigh an average of 2-3 pounds when they are full grown. 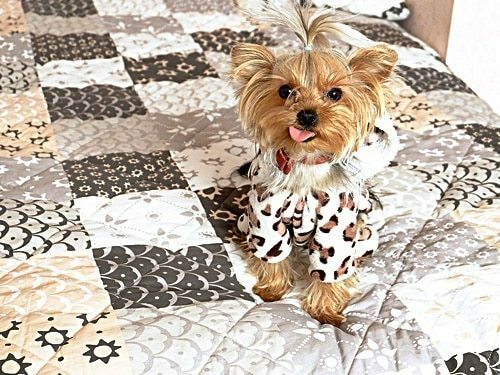 Compared to traditional Yorkshire Terriers that can get up to 7-8 pounds, these pint-sized pups can fit just about anywhere. It makes it very easy for taking them with you wherever you go. But, what’s the best pet carrier for a Yorkie? 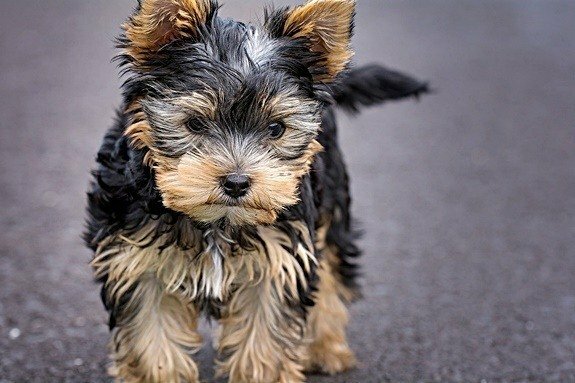 It’s important to consider that because Teacup Yorkies are smaller than the standard breed, you need to find a carrier that suits their needs and your own. You may have seen celebrities making this smaller breed of dog a bit of a trend when it comes to carrying them around. But, it’s not always safe or comfortable to snuggle your Teacup Yorkie inside a bag or purse. Specialized pet carriers are designed for your dog’s comfort, and of course, their safety. Choosing the best dog carrier for a Yorkie can make for a more enjoyable experience for both of you. Your dog will love being with you and feeling secure, and you’ll like the convenience of being able to carry them around with ease. 2 What Are the Best Dog Carriers for Teacup Yorkies? 2.1.1 What Are the Product Features? 2.1.2 What Are the Advantages & Disadvantages? 2.2.1 What Are the Product Features? 2.2.2 What Are the Advantages & Disadvantages? Yorkshire Terriers are intuitive dogs. They love checking things out, but they also love to be comfortable and relaxed. 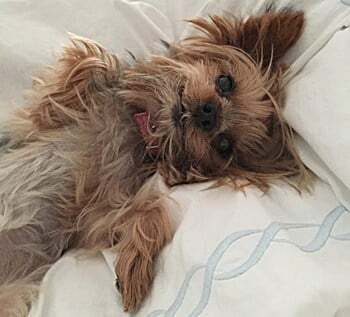 Owners typically raise their Yorkies to either energetic and playful, or delicate and well-pampered. Either way, Teacup Yorkies are a great travel companion because of their size, loyalty, and how curious they can be of their surroundings. Teacup Yorkies aren’t officially recognized by the American Kennel Club as a specific breed. Instead, they are Yorkshire Terriers that were born exceptionally small. With that in mind, you should never get a Teacup Yorkie from a breeder who specifically advertises them. Because of their size, they need extra care and attention. Sometimes, they will even require special care. They can be more fragile than full-sized Yorkshire terriers. They can be easily jostled around if not secured when traveling. However, that doesn’t change their naturally intuitive and curious temperament. Their attitudes are no different from that of traditional Yorkies, despite their smaller size. They will love traveling with you, as long as they feel safe. The materials that make up the carrier should be a high priority. Mesh panels are a good idea, as they not only allow you to keep an eye on your dog but ensure proper ventilation. Fabric should also be soft and comfortable, as well as durable and waterproof. Accessories and extra features can add convenience. Carriers should include pockets for things like leashes, or come with additional items such as food bowls, etc. Make sure the carrier is easy to clean. Some bags have removable padded interiors that can be washed and then reinserted. Don’t choose a carrier that is too big for your dog. For a Teacup Yorkie, picking a bag that is large enough for comfort, but small enough so that they won’t jostle around is best. Your pet’s temperament: You’ll learn very quickly how comfortable your Yorkie feels inside a carrier. Never force or push them into a carrier if they are clearly in distress. Your lifestyle: What are you using this carrier for the most? Air travel? Camping trips? Walking down the street? Consider your travel lifestyle and how your dog will fit into it. That can help you choose the right carrier based on your needs. Your style: Teacup Yorkies have become somewhat of a statement for their owners. It’s common for Yorkie owners to dress up their pets and choose carriers that match. While this doesn’t add anything to the overall safety or quality of the carrier, it’s something to consider based on the desires of your dog. What Are the Best Dog Carriers for Teacup Yorkies? 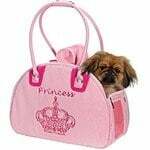 Below are three of the best pet carriers for teacup Yorkies. They are designed to work with the small size of a Yorkshire Terrier while providing safety, comfort, and additional features you and your pet can appreciate. Airline travel is a big reason people get dog carriers for their Yorkies. 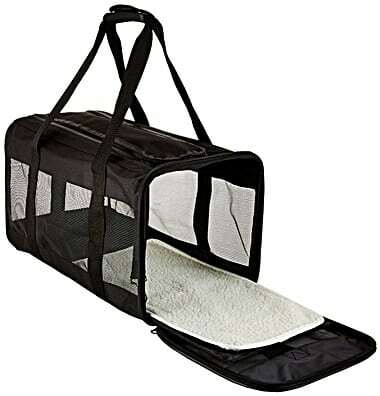 This 18 x 11 x 10 Soft-Sided Dog Carrier is airline approved and will keep your pet safe and comfortable no matter where you take them. It has plenty of great features that make it stand out from other portable pet carriers. 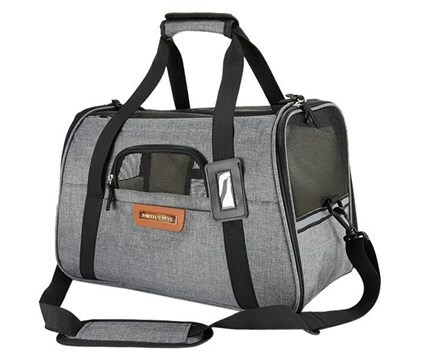 This Soft-Sided Pet Carrier is perfect for any travel. With a suitcase-style handle, an adjustable shoulder strap, and durability, you can keep it close to you, and your pet will love the feeling of being by your side. It’s waterproof, easy to clean, and is rugged enough to handle years of travel with your Yorkie. Plus, it even folds flat for convenient storage when you’re not using it. The AmazonBasics Soft-Sided Pet Carrier measures 14 x 9 x 9 inches and is designed to hold a pet up to eight pounds. It’s perfect for anyone who travels frequently and wants to bring their pet along and is safe enough to take with you in a car, or even on a plane. This AmazonBasics carrier is a highly-rated solution for extremely small dogs. Because it only holds up to eight pounds, it practically perfect for Teacup Yorkies. The size and security of the bag ensure that your terrier won’t be jostled around, and can be nestled in safely. With its mesh sides and zippered enclosures, you can feel confident taking your Yorkie with you everywhere. The Pawfect Pets Travel Carrier measures 17.5L x 10W x 11 H, so it’s perfect for dogs as small as Teacup Yorkies, providing them with plenty of room and security. It’s also airline approved so that you can take your Yorkie with you on all your travels. The durability and design of this bag are really what helps it to stand out. This Pawfect Pets Travel Carrier has been upgraded and designed with safety and comfort in mind for your dog. It has excellent ventilation, it’s easy to use, and allows you to carry your pet comfortably and safely wherever you go. Plus, it’s easy to clean thanks to the removable fleece pads, so you can use it as often as you like, and your pet will always feel comfortable and cozy. Pet carriers for Teacup Yorkies should be more about function, and less about style. That isn’t to say you shouldn’t choose a character based on your personality, and that of your dog. However, because of the small size of Yorkies, safety and security are the most essential features of a carrier. Because Teacup Yorkies do need a bit of extra care, choosing the right carrier that is snug enough for them to be safe, but large enough for them to move around can be a challenge. 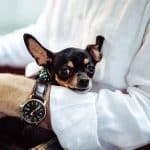 The best dog carriers for teacup Yorkies listed here are all designed to keep your dog safe and comfortable, no matter how often you travel.